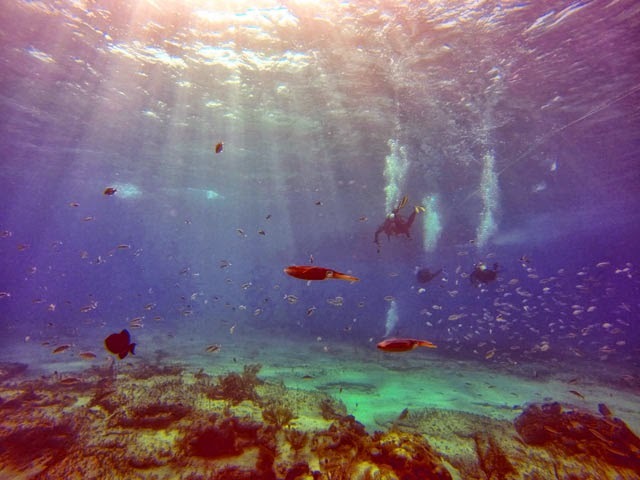 Aquarium staff recently returned from an expedition to the Bahamas. They'll be sharing pictures and stories from their time exploring the turquoise blue waters of Caribbean—complete with pictures, video, conservation notes and a taste of life on board a working boat. This post comes to us from Austin, who normally cares for the shorebirds on Central Wharf. Today was the real start of the collecting trip and was an exciting and productive day. 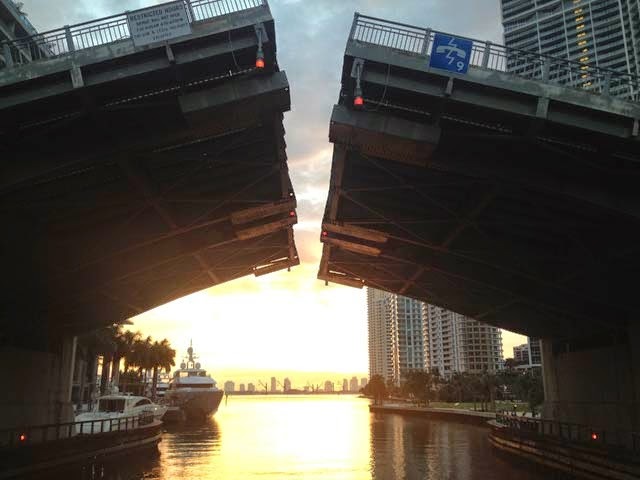 We set out at sunrise down the Miami River, passing under several draw bridges. After a calm ocean crossing of about 4 hours we found ourselves in the beautiful blue waters surrounding Bimini Island in the Bahamas. 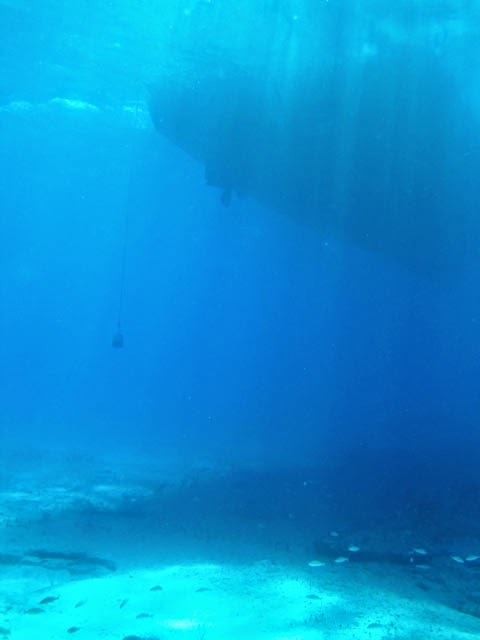 All of our trip dives were to take place around Bimini. 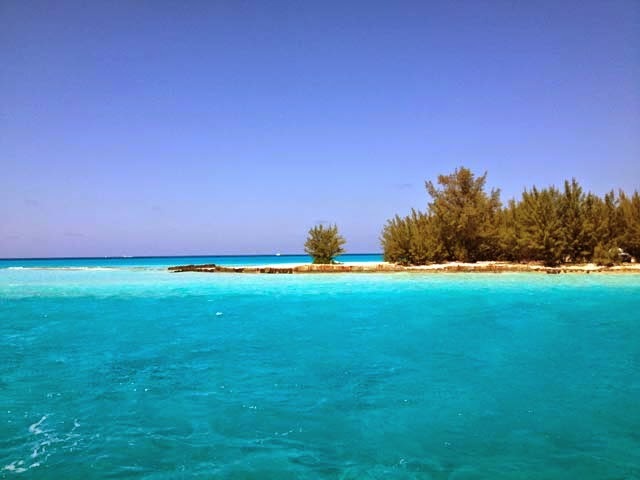 The turquoise blue waters around Bimini...Ahhhhhh. We did our first two dives of the trip at Rainbow Reef, a pretty area with many small patches of coral. Our first dive was observational and gave us a chance to test out our dive gear before the real collecting began. This was my first dive in the Bahamas and I was amazed at the abundance and diversity of the fishes at this site. We saw many of the fish on our collecting wish-list including angelfish, triggerfish, squirrelfish and wrasses, and got the chance to check out some cool invertebrates. 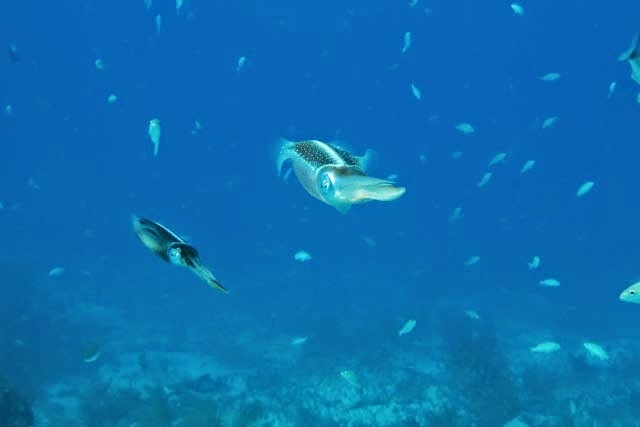 Aquarium aquarist Monika Schmuck took this picture of one of our favorite cephalopods, the Caribbean reef squid. We began collecting fish during our second dive at Rainbow Reef. My favorite fish that we brought on board were three trumpet fish. 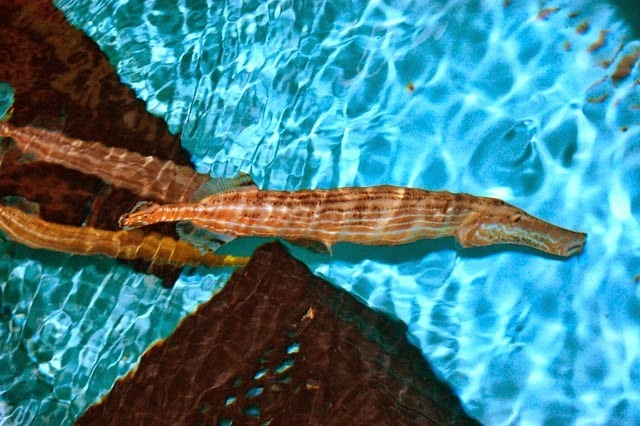 Trumpetfish are predators that hover beside the reef and are slow moving until they detect a small fish or shrimp to eat, which they inhale with a powerful suction generated by their tube-like mouth. 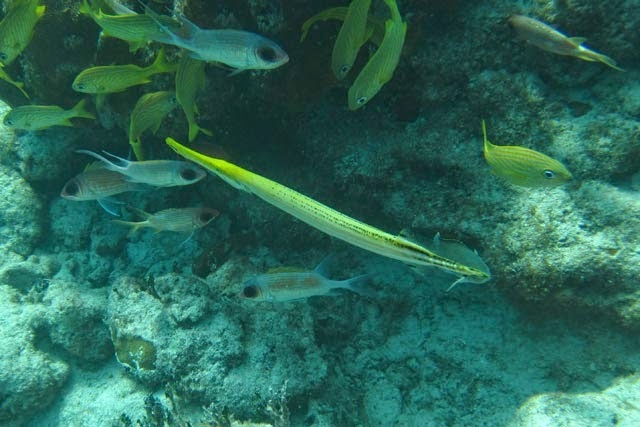 The team collected three trumpet fish including one with unusually yellow coloration. We decided that one of the trumpet fish was too large to be shipped back safely so we returned it to the reef. At all times on the trip we were extremely careful to collect only fish of specific sizes that could be shipped back safely and do well in one of our exhibits. All of our collecting is sustainable and is approved by the Bahamian government and the import of these animals is approved by the US Fish and Wildlife. and the import of these animals is approved by the US Fish and Wildlife.